Spring Forest wrote: Are there any good polishers of Japanese blades in the UK? For a modern production Japanese style blade?...No. Check your saya! If there is rust in your saya previously then all this will be for naught, if not removed. I've taken a vacuum cleaner to it... truly frightening... the amount of crud that came out of it! Dawn at 12.30pm. I think part of my paranoia was colour being picked up by the oil when in the blade was in the saya. So the next question... and I can feel my ring going tight here... is this a Chen blade? All the other photos of Raptor's that have been posted show hi's and hamon's and this has neither. Personally, whatever it is I'm still enamoured of the darned thing, but it would be nice to know. Is it a composite, or the real thing? [ Please ignore the books. I'm not trying to brag they just happened to be on table ]. Its a hanwei sword, technically its a James Williams blade, none of the raptors have a hamon, and each has a different blade style, the raptor you have doesn't have a bo-hi its the biggest heavyset blade that the raptor series has, I love the geometry of it. 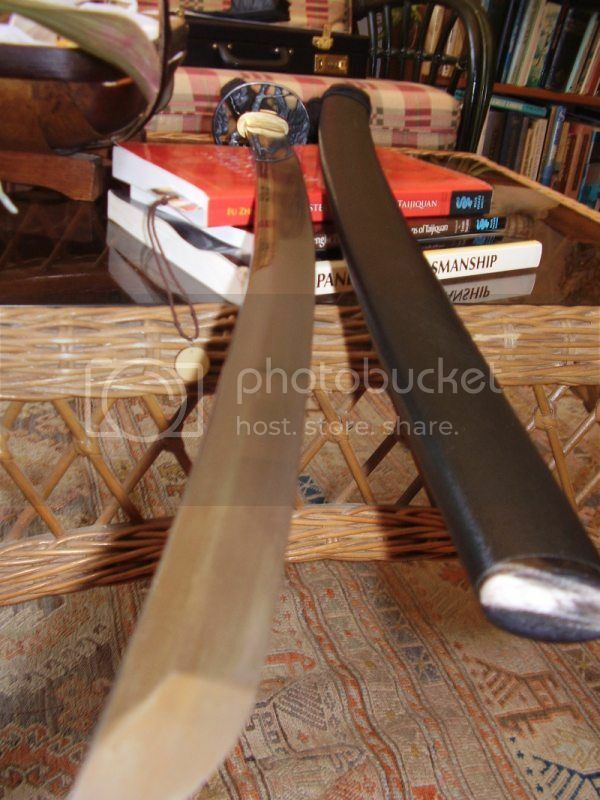 bobO wrote: A proper sword and a good purchase, hope to have the same one in my collection some day. Actually no, it's not a proper sword. The entire raptor series of blades was made for the backyard cutter. To serious practitioners and collectors of the japanese sword this is really quite evident. I'm not trying to sound elitist here, just stating a fact. Yes, this James Williams selling out to commercialism and the backyard cutting craze. These swords were made for the people who like to chop stuff up in their backyard, a serious JSA instructor would never reccomend them for serious training. Well that put a top on the Guinness... ney,ney, and then a reassurrance... you are correct ~ I've seen the images, thank you... is it a Chen blade!!? bobO wrote: Yes it is a Paul Chen blade made in association with James Williams. No it is not a proper Katana of course but a proper sword in the sense that it will cut a body in half with a half way decent chance of not breaking is what I mean. No bohi, which I like and a beefy blade, which I like. OH and also made with a good steel and a decent heat treat from what I hear, perfect for cutting buckets, hehehe For the record I rarely if ever argue with Dotanuki, even after 40 yrs of doing this I will never reach his level of skill or knowledge, I don't fight battles I know I can't win. Who knows BobO? Maybe if Spring Forest cuts some spackle buckets with this sword it might remove the rust! LOL !! bobO wrote: I don't fight battles I know I can't win. You've already won that battle. My tai chi instructor said "in order to win a fight you have to be able to run faster than your opponent". 'Nuff said. Last edited by Spring Forest on Sun Feb 10, 2013 2:17 pm, edited 1 time in total. Thank you guys. It wouldn't have mattered anyway... this is a beautiful blade whoever made it. Nice to know though. In order to win a fight, you have to run faster than I can throw a brick. Geordie Ross wrote: In order to win a fight, you have to run faster than I can throw a brick. Oh you Vikings crack me up! LOL, just by being that close to all that fruit was probably enough to start the blade oxidizing right back up again. Yea fruit ninja is best on the iPhone, a forum member cut an orange with a practical plus and the acid wrecked the finish on the blade, but the photographer in me says nice touch. PS you may want to investor in some renaissance wax in the sword maintenance section, it incredible for rust prevention and leaves a nice glassy finish, it also prevents fingerprints from sticking.